One of my favorite things to do with left over cake batter is make donuts. Yes, you can just fill a donut pan with cake batter, and BAM! It works. No need to make a special batter, or find a new recipe. 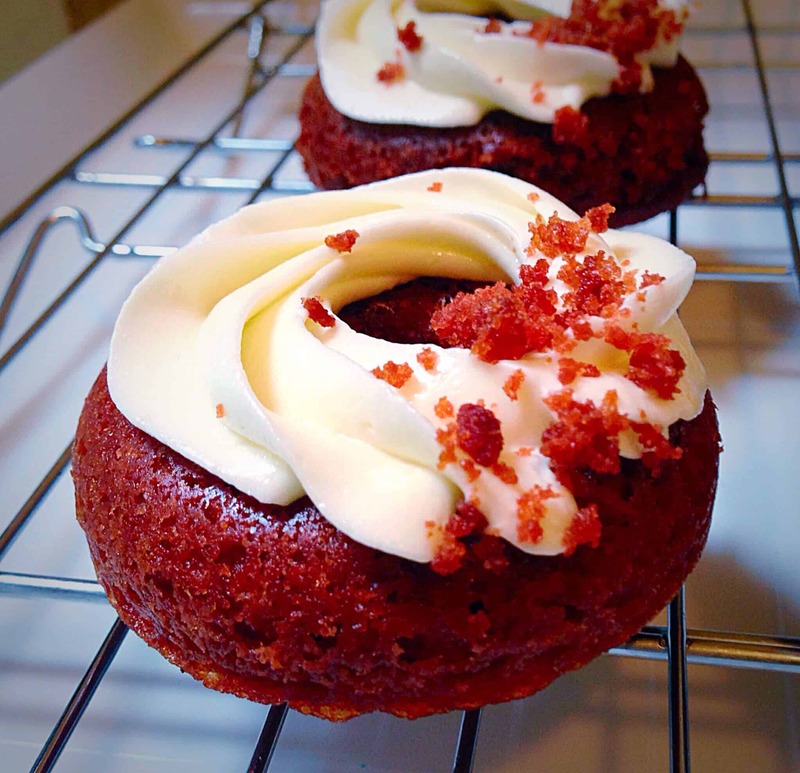 Cake batter = donut batter 😀 After baking a big red velvet cake earlier this week, I decided to bake some red velvet donuts, topped with a cream cheese frosting. Preheat oven to 325. Grease donut pan. In a medium bowl, whisk together flour, baking soda, baking soda, cocoa powder and salt. Set aside. In a large bowl, combine the sugar, vegetable oil, egg, buttermilk, vanilla and red food coloring. Stir in the coffee, and white vinegar. Combine the wet ingredients with the dry ingredients a little at time, mixing after each addition, until just combined. Fill each donut holder 3/4 full, then bake on the middle rack for 8-10 minutes, or until a toothpick comes out clean. Keep a close eye on the donuts, you don’t want them to over bake! It will continue to cook as it cools. Let the donuts cool in the pan for about five minutes, then remove from the pans onto a wire rack to finish cooling. Slide a knife or offset spatula around the outside of the donuts to loosen them from the pan. While the cakes cool, make the frosting. Combine the softened butter, cream cheese, vanilla, salt, and powdered sugar in a large bowl. Gently mix by hand, then finish combining with a hand mixer or stand mixer. Whip until the frosting is fluffy. Gorgeous colour and looks soooo moist. I didn’t see coffee listed as an ingredient. What kind of coffee and how much should we include? In the directions, it says to mix flour, baking soda, baking powder, cocoa powder and salt together. Although there is no baking powder in the recipe. Is there suppose to be? I would love to make these for a friend in a couple days, if I could get an answer. Thanks!! sorry, just a typo! It should’ve said baking soda! 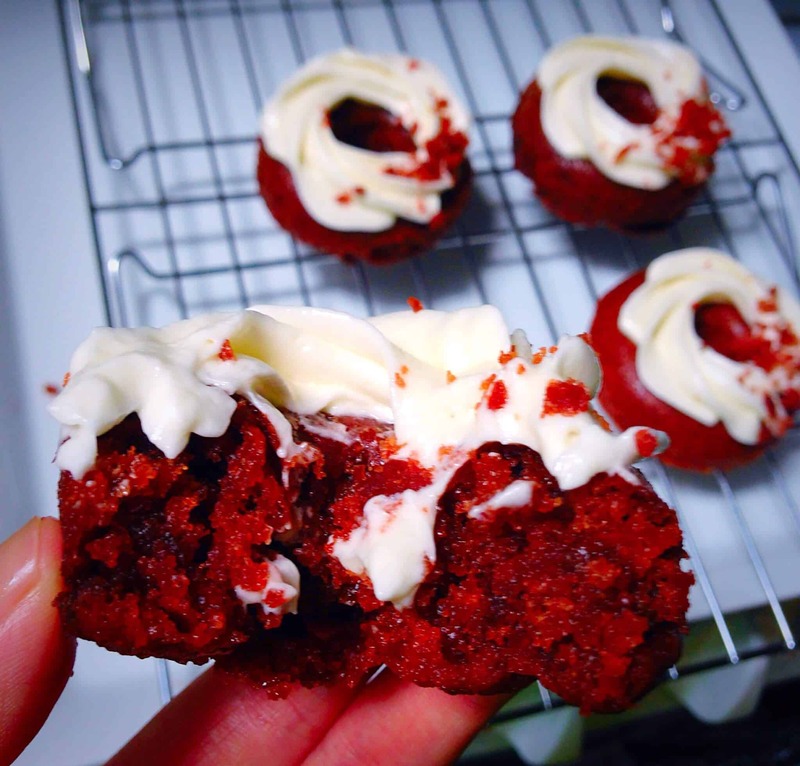 Have you ever done these as cupcakes? Any guidance on baking time? I haven’t! but I’d guess 12-14 minutes? ?